What better way to discover the diversity of this magical water land than by joining Broads Tours for a scheduled river trip. All trips include an entertaining live commentary; the skipper will explain the origins of the Broads point out the sights of interest and explain the abundance of wildlife as well as telling the odd funny tale. Light refreshments, licensed bar and toilet facilities are available onboard. A limited number of manual wheelchair users are very welcome on all of the boats, booking is advisable to avoid disappointment. 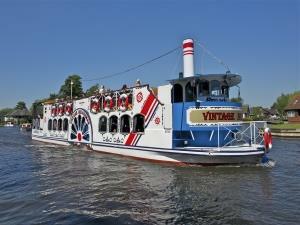 Groups and coach parties are very welcome on all Broads Tours trips. Generous group discounts and free coach parking is available. Broads Tours operate a daily trip timetable from 1st April - 31st October. See timetable on the website www.broadstours.co.uk. During winter months a trip can be arranged for groups at a day or time to suit. Minimum of 25 passengers required for a bespoke trip. Timetabled river trips operate from 1st April - 31st October. During the winter months a trip can be arranged for a group, minimum number required. For the Festive months of November and December we can even provide mulled wine and mince pies for your group.